Most relationships start out with sunshine and butterflies! You can’t wait to see each other and you love to do special little things just to make your new-found love happy. And then, you start to get comfortable – maybe too comfortable. Some people refer to it as “just being real” or “settling in”, but not making a consistent effort to make your partner feel loved can slowly take its toll on your perfect romance. A part of this is taking the time to make little romantic gestures that make your partner feel truly loved and appreciated! 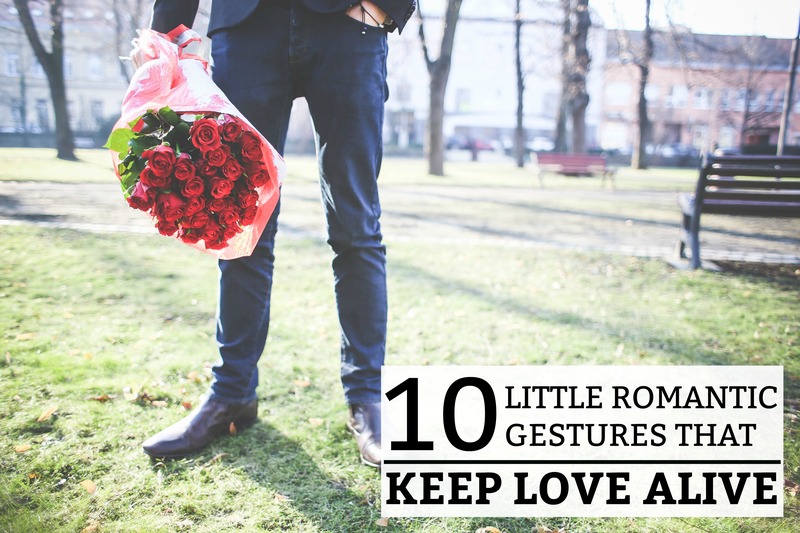 Below are 10 little romantic gestures that help to keep your love alive. Most men are instinctively protective and enjoy putting their arm around their girl or holding her hand as a sign of protection and ownership (in a healthy, nontoxic way). Women love to feel protected and secure in their relationships – PDA being a wonderful way to increase these feelings. You shouldn’t have to feel embarrassed to hold hands with your partner, kiss them, or tuck your arm in theirs – in public! Whether you personally deliver it or have someone else drop it off, everyone loves a good surprise at work! If you have any doubt about this, just pop on over to social media. There are always girls gushing over flowers that their significant other sent to their workplace or a man elated over a meal delivered to his desk. Not only does it make them feel special, it also announces to everyone at their workplace that their partner is incredibly thoughtful. Who doesn’t want someone to cook a delicious meal for them? Better yet, invite them over or surprise them at home with a delicious meal and pre-set table. You can create a romantic setting with candles and music. If you don’t feel like a natural romantic – don’t let this stop you! Just light the candles and turn on the music. This gesture is timelessly romantic and always a success! Once you’ve been together for a while, you start to know each other’s preferences. This makes it very easy to stop putting any effort into planning your dates! Surprise your partner with a pre-planned date. Don’t tell them where you are going or what you have planned. Just make the date all about surprising them with new places or taking them to places that have meaning to you both. Perhaps you love to binge-watch TV shows or have a Netflix marathon? If you don’t have a TV in your room, drag your mattress out to the living room and spend the whole day watching shows and hanging out. Have a lazy day! You can never waste time investing in your relationship and bonding. Order pizza or Chinese takeout. Just make the day about you two! Pro Tip: If you have kids, invest in a sitter. Sometimes, you and your spouse NEED some time alone (for more than just a few hours). Have you stopped just doing the little things for your partner? Making them food, bringing them flowers, buying them a coffee, fixing something around the house, giving them a massage, taking them to the movies, buying their favorite little snack, etc. It is the little things that can add up into a really big thing! Why, when we get comfortable in our relationships, do we stop or forget to do those little things that our partner loves so much. Bring back the small things! You’ll notice a big difference. Every classic movie includes the surprise picnic in the park! This is because it is a timeless gesture of thought and romance. Picnic lunches do take a little thought, but they are so sweet and fun. Common picnic foods are as follows: sandwiches or subs, chips, trail mix, cheese, fruit, wine or soda, chicken, bread and cheese spread, etc. If you are short on time, just go to your local grocery store’s deli section and purchase a few things for lunch. Bring back the picnic lunch! Does your partner like head rubs, back rubs, foot rubs, etc. Get some body cream or massage oil and invest some time in their comfort. This can’t be left out because it so so so important! This tip is rather self-explanatory because you know what to do. Add some spice back in your life! Don’t let this important area of your relationship go dead. Yes, it takes effort. And sometimes, you might just not want to. But put the effort in! It is always worth it. Little romantic gestures can go a very long way at creating a happy environment in your relationship. Put in the effort and try a few of the things listed above. You will never waste time investing in the people you love.